I have in my bunny paws one (1) Jolla smartphone device that I want to gift to a deserving person. This is not sponsored by Jolla, this is from me (Carol/bunny/cybette) personally. I bought this Jolla myself a few months ago (and I didn't even get to use the friend voucher that's been going around). Why do I want to give it away? Well, I already have my own Jolla (which I bought along with all of you "The First One"s) and I know there are people who need/deserve a Jolla and for some reason or other haven't gotten one yet. So this is for you. 1. You don't have to follow me anywhere, like/share/retweet any of my posts etc. to participate in this givewawa. However you need to comment on *this* post that you're reading now (unless somebody copied the post somewhere else, of which I'm not responsible for). 2. Don't mention me on twitter, DM me on Facebook, call/email/whatsapp me (I don't use whatsapp anyway) trying to enter this givewawa. The *only* way to join is to comment here. And just one comment please, making many comments does not increase your chance of getting the Jolla, and instead might piss me off so I won't choose you. 3. Speaking of choosing, *I* get to pick the person to get the Jolla. Not Jolla (the company), not by voting (those can be manipulated), not random lottery, not God, not Marc (sorry sir), not Iekku (sorry sis), not James (wawaboy), just me. 4. What impresses me: projects you've done (preferably open source or related to Sailfish OS, but doesn't have to be), people you have helped, communities you have contributed to, symphonies you have composed. What doesn't impress me: boot licking, bad mouthing others, saying "first!" (that's not a reason). 5. Be creative, but more importantly, be honest. Maybe you want to let your grandma experience Jolla. That's great! I love my grandma. 6. Note that I'm shipping the device from Finland. If you participate, you agree that if I choose to give the Jolla to you, you'll pay for shipping + applicable taxes to wherever you're located. Note again that outside Finland I'll have to ship via DHL/FedEx as Finnish post does not allow shipment including a battery, and it will cost upwards of 100€. 7. Care and warranty: Jolla's warranty only covers countries in the European Union, plus Norway and Switzerland. Keep that in mind. I may be able to answer some simple questions and direct you to TJC. For possible hardware issues, it'll help if you're in the covered countries when contacting Jolla Care. I won't provide swaps/exchanges. 8. If you're the chosen one, I will need to get some personal information from you like full name, email address, mailing address, phone number and whatever is needed to ship the package. Your info will not be shared with anyone (except the shipping company). 9. I will make my choice on/around November 12, 2014, and announce it on this blog. The person will need to respond within 4 days. Exact deadline will be given in the announcement post. 10. You are welcome to ask me questions, but it has already been answered/explained in these terms and conditions, that will count against your chances. If you've read diligently until here, you should be fine. 11. The usual clause about me (Carol/bunny/cybette) reserving the rights to change my mind anytime, I may decide nobody is qualified to get a Jolla, or I may be impressed enough to give away two. Being fickle is not always a bad thing. Once again this givewawa is in no way sponsored, endorsed or administered by, or associated with, Jolla (the company). This givewawa is open to everyone above the age of 18, even Jolla employees (although you'll have to come up with a very convincing reason), in whichever country this is deemed legal (your responsibility to find out, not mine), as long as you agree to the T&C above (read carefully, especially #6 as it involves possible incurred cost on your part). ooo my Goodness! You giving brend new Jolla for free? and I only need to pay shipping to me? did I read this good? woow! I know You say try to be creative and honest, but how? after read this, My brain froze at the thought of what if She choose me? I have to settle for Jolla theme on my nexus 5 and wearing my "I am the first one" t-shirt. 1. Since my brand new Jolla I had bought a couple of weeks back was stolen from me in a bus when I was sleeping! And I can't come to terms with this loss. 3. Because my mom would be overjoyed to hear that I got a new Jolla! I did forget to mention that I have been a KDE contributor for the past 3 years, helped/mentored some nice people to begin contributing to KDE. Adding supernovae to KStars was the first feature I added to any application and I want to write a related but lightweight application for Jolla. I love open source communities and I do idle on #jollamobile and #sailfishos among other channels. Definitely the most I had ever boasted of myself. Kolmas commentari. Tiedän my finnish is bad. Toivotavasti jollan puhelin on success. I like the community around this phone. And surely my grandma needs a new one, so she could call me from heaven. Heippa! My name is Andrey. I'm opensource enthusiast and community developer. I have a girlfriend. Her name is Mira. She is my beloved, my muse. She likes linux and applications i developing. Mira started liking Jolla after seeing first promo pictures/videos. After I received my own Jolla, she started liking it Much more! Her old Nokia N9 lagging sometimes. I'm helping to fix bugs, but it's time to get a new device. Mira will have birthday in November, and best birthday gift will be Jolla. Best wishes and Happy Haloween! I just want (if posible) a +1 to CODeRUS, a great SailfishOS developer ho made a bunch of apps for it, being Mitakuuluu (a Whatsapp client for SailfishOS) the most known. I don't want to participate because I don't deserve to win this givewawa. I love free (libre) software and I helped and continue helping a lot of people begining with GNU/Linux in my local LUGs and internet, but I am not a developer, and I don't have big contributions to maemo/meego/mer/sailfishos community. I entered the givewawa myself but, as a user of CODeRUS apps, I want to support any initiative that would incite him to make more. And giving a Jolla to his girlfriend definitely seems like the kind of things that would motivate him. I add my +1 too ;). I wish I could write a symphony, but no. Truth is, I was on your boat from launch ("I am the First One"), but recently I dropped the device so bad it cracked the screen rendering it quite unusable. Having screed changed seemed too much of a hassle, and so I changed Sailfish back to Cyanogen Android. I cried myself to sleep every night since then. I don't want to miss out on all the fun you're having with the shiny Uitukka (which I honestly find a rather offensive version name, as I have a strongly receding hairline and I don't know how to swim. This reminds me of both.) Tukka or not, I could really use the buoy you're throwing in the water to get me back onboard to Jolla. I'm a Nokia fan(before Elop) and since 2012 i follow "the movement"
and became a Jolla fan. i love being part of the jolla community and the N9 community before that, because I know what communities can achieve when they set their minds to it. The Jolla community has this attitude! In 2012 I initiated to participate in the Japanese Birdman contest. Build a human powered aircraft and fly it as far as possible. Where other teams build years on their planes, we only had an idea and no people to build it. An outcry to the community and people from allover Japan joined and started helping building the plane. We finished the plane in record time, 2 months, tested and tweaked it for another month and competed in the contest which was aired on national TV. Team Holland had some great PR that day. We did not win, but we felt incredibly proud to have pulled it off.... We will be back with a better plane in the future. As one of the "First Ones" Jolla users (Jolla has been my first smartphone) I have had the opportunity to enjoy and feel the very unlike experience offered by Jolla, its innovation, freedom and strong sense of community. I would like that my wife could have the chance to feel what I've felt using, working and living with my loved Jolla. She actually needs a new phone and I think that Jolla and Sailfish are the right choice to start with a phone from a very different view. I must say that my wife always look at the Jolla with curious eyes when I use it and I think that she loves it. This is why I would be extremely happy if Carol choose me (and my wife) to win this amazing Givewawa. My wife and me are both journalists in local newspapers in Seville, Spain. I've been working on technology and video games sections and she is working on the newspaper website. We love new and different technologies, so we try hard to be well informed about the most advanced tech for us and for our jobs. Years ago I was games and software developer so I understand all the passion and hard work behind Jolla. Also, I'm the founder and administrator of Jolla Spain, a small but passionate community of fans that intends to spread the name of Jolla and its philosophy. Ok here goes,I don't know that I need or deserve a Jolla. I already have one however I'll explain why I want to win. I've been a huge fan of Nokia for many years. I was so excited when the N9 was announced it was the phone that was gonna give android and ios a run for its money. I was heart broken and excited when I heard about Jolla. I was heart broken because at that moment I knew Nokia had given up but excited because all my hopes and dreams would live on with Jolla. So at any rate the reason I would like to win is because of my 4 year old, he is well on his way to becoming a huge phone geek. We have TVs, computers and tablets but the device he always wants is my phone. He loves hotwheels, angry birds and legos he love to watch videos about this stuff on youtube (supervised of course) and I've told him if he wants to watch he has to learn how to spell what he wants to watch and now he can (4 years old). He loves to play games and has used viber to talk to his grandparents in the Philippines.His mother and I are gonna get him a phone or ipod for christmas but if I won I wouldn't have too. He knows that my jolla is my pride and joy. He calls it "Papa's special phone" and if he got one he so excited. It would help me show him he doesn't have to conform to the popular ideal that android and ios is best and he could stand out as a free thinker. As I said I don't know that I deserve to win or need but I want to win because he is the future. He is the other half. Thank you good luck everybody and Sail on!!! First, a bit of bootlicking, I really appreciate the fact that you want to choose the person that will receive the Jolla. This is a very nice initiative and, although you ask people to talk about their involvement in open source software, I hope that you will not only rely on that, as I think people outside of this kind of community also deserves this wonderful device, even if they make only a basic use of it. I also appreciate the fact that you will take the time to read all these comments, this is truly amazing :). I am a gadget maniac. I had a Palm Pre 3 and now I have a Jolla. I gave money for several kickstarter campaigns. And the only mobile app I've ever done was an iPhone app using the Neurosky Mindset (it was an app to detect attention loss while driving. However, I had no iPhone nor car to test it when I coded the application xD). Given my newly acquired knowledge in the medical field, I have several ideas for medical oriented applications but I have no time to code them... I'll give it a shot after graduation. So why do I need a Jolla, as I said that I owe one? My reason is the same as CODeRUS. My wife is my muse and my main motivation (you can see exactly the way I feel by looking at the movie "The wind rises" ;)). She had a N900, I've done my best to keep it alive, but it fell once and died. I couldn't get spare parts to fix it so she had to take an Android device and she's not happy with it. We're having some money problems as my salary went down when I started my PhD and because we hired a contractor to build our house and there are many problems in it so all our money is going to fix them and into the lawyers right now (http://bazemont.blogspot.fr, sorry it's in French). We couldn't afford presents for each other during the last 2 years for birthdays / christmas, so a Jolla would really make an awesome gift for her. I know, these are first world problems but don't worry, we have most of time enough money to buy proper food ;). Well, that's it. Sorry for the long post but you asked for motivations, well, you have what you deserve. I'll also shoot myself in the foot but I've seen that CODeRUS applied and I can't help supporting it. I use his apps every day, and he was the one to answer me when I asked questions in the Sailfish OS mailing list. The choice is up to you, but it would definitely be a good choice to give it to him ;). Thanks for reading, and for this awesome initiaitve, have a nice day ! Never had this problem with my Jolla! I don't have fancy accomplishments or anything like that because I'm not that technical, but I do love my trusty N9 that I still rely on to this day. As much as I love the N9, it is nigh time for it to sail into the sunset. Here in Singapore you see people's faces constantly planted into their phone screens -- even when they're walking -- and the phones are predominately of two flavors: Apple and Android. Conformity is rampant in Asia. If I ever get a Jolla phone, I would evangelize it everywhere I go to let people know that there is this other mobile platform out there that is like taking your first breath of fresh air after ten years in prison. I would show people how to use their fingers naturally for the first time, and no doubt they would "get it" right away because swiping through the Sailfish OS is natural like that (based on my experience with MeeGo). Conformity is contagious. If I ever get a Jolla phone, I would not use it as a phone -- I would use it as a knife to cut through this conformity and stop the contagion. I'm not set out to change the world, but I can begin to show the people of Singapore what The Other Half is all about, one MRT station at a time. My story is that two weeks ago, I went to the the beach with my girlfriend and a boyfriend. We went to take a walk, we stopped to swim a little and right after we jumped into the water, zas! A little but strong wave came a reached our phones we have left resting in the sand. I think they wanted to joined us but did not how to swim jaja! I allways rice my right hands and say HELLO! This time my hand is empti and needs to be filled. If you filled my hand, then everyone can see what kind phone i own. Sorry for my bad English, Andrea, Italy. Please do NOT give it to me, because I have already one. If you do, I will have to go to my office saying : "Hay people, is any body else wanted to be unlike like me." 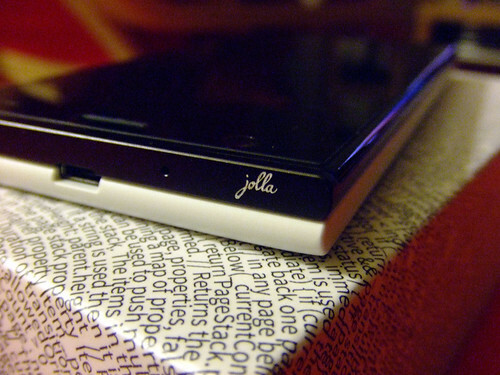 I would love to get Jolla because to me it's the most interesting piece of tech at the moment. I'm just getting into the smartphone thingie, coming from Maemo gadgets (N810, N900). I'm currently a volunteer in a senior citizen pc-club and i really like teaching. It would be ideal to get all kinds of different gear to show them what's out there and help them choose purchasing suitable hardware. I'm unemployd at the moment and things aren't looking good here in Finland. Can't buy any new gear, so that's not cool. I love what people at Jolla are doing, it's very bold move to challenge the big players in mobile business. Hoping we see Jolla tablet someday. Was i right about the tablet? I had a Jolla and was a very happy man. Then I got confused with an Android-device (OnePlus One). It ambushed me to think that it was also unlike. I miss my Jolla, so much more simplier, neater and made by folks with love. I used to spread the love of Jolla but now I can't and it saddens me. I wanna promote Jolla in Hungary. I use a Jolla myself, but everyone has heard about Jolla from me for the first time. My plan is to give it to a nerd friend who would right away get the SDK and start to play around. There are many people who deserve to win a Jolla and I love the givewawa Carol! Do I want to win? Of course! I'd be crazy not to! I only got to use the Jolla for a few days last year (fortunately it was over Christmas) and I loved it. I've been following the developments closely and even been using the latest builds on my Nexus 5, trying to port it to the M8 and generally just community engagement. While I would love to win, I feel there are people who are more deserving than me. This isn't a comment to go in the running, more of a dedication to all those in the community who are so very active, even without a Jolla device of their own! They are truly unlike and I just want to thank them! I came to this blog only after I read about the Giveawawa!! (giveaway :)). 1. I would want another Jolla mainly because I like tinkering and modding phones for updates and then help others with it too. For e.g. I am running a custom 4.4.4 on my tab2 and installed the same on two of my friends tab2's. Having another jolla will just help me increase support for Sailfish as a non-developer. 2. my family has 2 Windows, 2 BB10's, 2 Androids and only 1 Jolla. Another jolla will complete the pair. I need a Jolla because my loved N900 died one month ago. I'm trying to port Sailfish OS both on Xperia Mini Pro and eventually on Asus Padfone A66 (but for the last one I need first to port CyanogenMod and isn't so easy as other devices). I got my Jolla less than one month ago. I entered the store a few minutes before its closing time and went right to the cellphone clerk telling him "the Jolla, please". He looked at me a little stunned, because here in southern Italy "yòlla" means "bizarrely dressed, insanely hairstyled, frivolous talking elderly woman"). I then slowly added: "that cellphone on the right side". After a looong second he asked "the 349 bucks one?" and finally took it, opened the box and began showing me the contents (I bet it was his first time to show a Jolla). "Yeah, yeah" I told him, "no need to show, I'm buying it". A little more stunned than before he gave me an unopened box. I paid cash, and opened the box right after exiting the store (while some other clerk was asking him: "what did buy that already-made-decision guy? "): a few minutes later I entered the underground train with Jolla in my hands already on the lock screen. I'm very keen to have a Jolla but unfortunately it's not available in New Zealand. I currently own and use an N9 but unfortunately the battery life is gradually dying out. I'm attracted to Linux, my dedicated server on CentOS and Virtualmin Pro and Archlinux on my laptops. The reality is that I'm an early childhood pre-school teacher and would love to have a Jolla to accompany me alongside my teaching. This ‘Givewawa’ highlights what I love about Jolla and why ever since the company’s inception, I have wanted to own a Jolla device. The community. This competition is a wonderful idea Carol and from all the responses so far, there are some very deserving people who have devoted much of their time and effort to help develop Jolla/Sailfish and build a strong community. Over the past three years I have been studying BSc (Hons) Geography full-time at University and recently spent my savings on going to visit my girlfriend and her family in Langfang, China. Thus I feel aggrieved that I have not been able to purchase a Jolla device, due to a lack of funds, and get involved with the Jolla community in a meaningful way. As a Geographer, the concepts of community and development really are a huge draw and I feel owning a Jolla device will allow me to become more active in the Jolla and wider open source community and as a fresh graduate, hopefully lead to a future job in this field. A community driven project like Jolla/Sailfish, that aims to initiate transparent development and openness, has the potential to change not only the way we develop mobile technology but also how development more generally, particularly in LEDCs, can be achieved. Using bottom-up approaches, engaging the community and using their knowledge/expertise. Therefore as a geographer and tech enthusiast, I’d love to get my paws on this Jolla smartphone to help grow the Jolla/Sailfish community and begin to show the world that community-based innovation can stimulate, open, transparent development for all. Good luck to all, sail on! I think we need alternatives to Google and Apple. I'd love a Jolla phone but can't get one here in the US. I have been mentoring high school age kids in my community for 10 years now. I bring them on board as interns at my place of work and teach them about art and technology. I've even spoken to them about Jolla, the politics of platforms and the importance of competition and diversity in the marketplace. Just because I didn't receive any present on my birthday... for last five years. Just an ordinary dude with an ordinary life. Hi. My name is Robert Pal, and I am 24 years old. I didn`t contribute with anything yet to opensource communities, but I love them, and I love linux too (ubuntu, elementary). I`m a Nokia fan, and my dream was to have a Nokia N9. I hate Android and the all google things, I would rather use Sailfish, Meego, or Windows, or Ubuntu Phone. Unfortunately I`m not abble to buy a jolla, or N9 phone because it`s expensive to me. As a programer is Romania I`m very underpaid. I can only live with my salary. That`s enough abouth me. I`m very happy to hear from people who don`t care abouth money, and likes to donate, and make others happy. God bless thay and good luck for everyone! It was Slush last November when I did (!) hold Jolla in my hands. It was moments (days) before Tomi Pienimäki went to TheOtherHalf opening in DNA store..
During my visit in Finland I was impressed that almost all of the startup people in Slush did talk about Jolla phone as for the rising hardware and software product for Finns (sometimes also called as “future Nokia”, a “gadget with hope”).. The positive impression was all mine when I as a blogger got a chance to talk about the phone, take pictures and share my Jolla story with friends in Latvia (and I must say – the tech-savy people were excited about the phone). So far I have not meet a person in Latvia owning a Jolla (ad we haven't reviewed it in kursors.lv properly as well)..
What do I do to deserve Jolla for me? I'm trying to connect strtups with positive (as well as negative) knowledge from more experienced entrepreneurs, writing and sharing interesting content. I'm foursquare ambassador and super user (still doing map edits and other 4sq/swarm community projects). StartupGenome and other smaller side projects too are among the things I do daily. My current work experience is acquired and developed mostly in the field of marketing and as a project manager of public relations by creating, explicating and highlighting ideas and programs in order to affect the public perception. I’m a full member of Latvian Association of PR Professionals (LASAP). Working with knowledge and passion for social media platforms (Facebook, Youtube, Twitter, Google+, Flickr etc.) and how they can be successfully deployed.. I'm not sure, frankly, is this good enough to be the special Jolla person, despite the fact – I would be happy to be one of those who has a other half's life with Jolla.. Anyway – hope that when You decide that one of the readers of this blog is just the right person to have Jolla experience there will be interesting content to read about how it runs, how people are reacting seeing Jolla (because I think this is sill an absolute rarity) and how the regular smartphone user can play with sailfish OS..
Good luck and – thanks Carol! I'm vakkov (a.k.a crazybulgarian @ twitter). I was first cooking my own ROMs for my 5800 but this device was just pretty closed for me. After that I switched to the n900 and everything changed. Because of this awesome phone I completely moved to Linux and began learning as much as I could. I was soon modifying the nitdroid kernel so that it uses Stskeeps' u-boot (back then I was still 16 and all I wanted was to have a stable android port for all the fancy games I couldn't run in maemo) . But soon the usb broke; the sd card cable was damaged while repairing the usb and the device completely died after a few months. But I continued hacking around on linux and testing some code on my brother's n900 and an year and a half later i bought another n900. Started playing with nemo, learning things about mer; following some steps from krnlyng and thp i tried to get android running in a window in nemo and maemo. After that i started porting mer to all the gadgets i could (several cheap Chinese tablets.) and i was also updating the nitdroid adaptation (never pushed the changes to gitorious which was a mistake because my pc hdd died). Meanwhile I was trying to learn Qt... I did some Wayland effort on the n900. Then I didn't do much mobile-related stuff for about 9 months. And after that the hadk was released (wooo-hooo). Ported sailfish together with beidl to the galaxy nexus. Almost ported to galaxy s+ for a night (this port needs to be finished and released). All the n900 knowledge from the past got into use. Now porting mer (for nemo/plasma and sailfish purposes) to the olinuxino and if I finally get uart working on the n900 i might build a kernel higher than 3.x for it and finish my hybris port... I am also thinking of getting an n9 just to give it a hwcomposer and to get it on hybris. I am also working on getting android apps for the hadk devices (together with krnlyng). AND last but not least - I am helping with what i can in the irc channels. P. S. And i don't own a Jolla. Would like to get one to develop some stuff on. I would only use it for the spare battery because those are still not sold seperately yet. Every comment that tries to win you over is ultimately boot licking. I want jolla, because i still use nokia e52 because i don't want to support apple or google. My contribution to open source application is little. As I use arch linux, I report bugs from time to time. I also contribute some arch wiki including translations (from English to Japanese). If I were to get jolla, i want to write japanese applications, create japanese ports of existing applications. I already have one Jolla phone, but second one would be for my father, who is quite interested in having one. Wow so many good comments and so many great people in here. People who offered so much for Meego/Sailfish. i'm the developer for one and only TuYa sticky note cross platform app. whenever there is a new platform, i will try to port my app to that platform. i would like to have my TuYa App to be ported and run on the Sailfish Jolla Platform. i can confirm that as all the rest of the cross platform app are design. coded, and tested with the actual device. it provide the true user feedback on how's the app looks in term of size and how it works again multi-touch etc..
i'm unable to proceed further. thus i would like to request to have that Jolla phone so that i can carry out all my designing, developing and testing of my TuYa App. Getting married and travelling for work prevents me from actively developing on it at the moment. Why do I want the Jolla phone... Since the announcement of the Jolla company and phone I have been eagerly waiting for Jolla to come to South Africa. I got hopeful when one update listed ICASA certification but my hopes was shattered when it was announced for Namibia and not South Africa. My current N8 will not be able to last for much longer, it already has a few pieces missing. I just can't commit to a new phone because I will always believe that Jolla will come next month, even though I have been hoping for a year now, but next month I tell you, it will be released in South Africa. I will be happy to carry the cost of shipping, since it will be cheaper than flying to Finland and buying one myself (which I would have considered if I had the money, but I don't). As a broke physics student with a healthy affinity to Linux and a cherished NOKIA N9. I would very much appreciate a new Jolla phone...to a large part because my N9's battery is going numb. Why a Jolla phone in my hands would not be just good for a student, but bring glory and love to the world: I am part of the local hackerspace in Slovenia (EU) with a brand new almost functioning 3D printer that I ended up being in charge of (it needs one last more part installed and it's ready to go) that we could use to produce several useful and probably even more useless other-halves...or a kitty-ear-penguin TOH case...you may at any point ask for one :D also any other other-halves we could conjure up. We have both software as well as hardware developers and enthusiasts, both groups silly enough to hook up the phone via printed other-half to our newly acquired caffe machine (bless its unknowing electronic soul ♥). And I am sure at some point we could make something actually useful out of it. If not, it will at least help a group in a hackerspace expand into another branch and maybe attract more new people and spread awareness. As far as family, I have been trying to convince my family to change to Jolla phone or any Sailfish-running-phone of the future in the next phone iteration to come. A device in hand would drasticly improve such a possibility. We could also make it a bunny-ear-other-half. I'm a from Spain but i work in Germany in a High School as a Teacher. No, I'm not a developer but i contribute to show to the Children how good is Open Source. Last summer we did a project in the School to rescue old computer with linux. A group of 20 teenagers and me have done a computer classroom with those old computer. This group had no experience with Open Source before and they were all impressed, how good are Open Source solutions. Many of then have installed Linux as well in their computers after this project. Sorry for my English, but i have spoken too much german in the last time. Hi, I am Joice M. Joseph, a Jolla Fan, open source enthusiast, and a free thinker. thank you for making this Givewawa(*) at your own risk. this is Saad looking for this giveaway to find my way. Just flashed SailfishOs port on my beloved GNEX, lovin it so far..badly wanted to feel the Qt goodness...kudos for this giveaway. What a fine piece of hardware. I would love to put it through its paces here in the US. How well would it fare in the hands of a handy anarchist? Only one way to find out! I already have an N9 (running Sailfish theme) and as far as I’m concerned it is/was the bee’s knees! In fact it was my first “smartphone” (I still find that name silly) and of all the mobile OSs I used so far it is my second favourite, bested only by Sailfish. Sadly it is beginning to show some age. For my business phone (FSFE¹) I have a hand-down with some Android running on it and it’s only the Stella launcher that’s making it bearable. I’ve supported Jolla from the very start, but didn’t commit to buying it at that time due to 1) just buying the N9 and I don’t throw away hardware, while it still runs and 2) well, I just *bought* an N9, which put a dent in my budget. So, unless I get this first Jolla, it seems I might be buying the Jolla 2, once one of the two phones I use (hopefully not the N9!) dies. If I win this, I will try to make a prototype out of a portable Yamaha guitar amp, that I already acquired for this. The project, would of course be Open Source Hardware and I would very much welcome anywone crazy enough to like this idea to help out. P.S. FWIW, I am also a real sailor. Argh! 1: Yes, I’m lucky to work for Free Software as my day job. And in my free time I try to contribute what I can back to the community, mostly with translations, bug reports, legal help and networking people. Had a N900 in the past and used to love it! Would like to see the jolla, never seen one in my hand! My name is David and I am 16 years old and I love open sources, deforming Linux, and composing music. I am a fan of those who make their work commonly available, allowing me and everyone to explore what it is made of. Trying to run out out of the box, I made this: youtu.be/MOIf_gdfzMY. the fact that the program I used is not really suitable for live-performing tempted me to give it a try, which eventually made me become quite creative. For me, it is huge fun to discover new opportunities of things beyond its original purpose, whether it is using the Blender game-engine to create a 3D powerpoint about planned obsolescence for school or converting grandma's 1950's fridge into a computer suitable for audio-production (yes, I actually made those things). Reinventing and modifying is how we evolve, this is how fish grew feet, this is how arms became wings, this is how Nokia grew Jollas. Even though GPL and CC wont make us grow wings, it enhances this natural process of progress and development by permitting us to change, to make a difference. Thus, I am highly encouraged to join communities of similar minds and make a living with opening up my efforts to the public. Currently, I live as an exchange student abroad, in Panama. Far away from family, friends and free-software crowds, I am seeking for personal experiences to learn some Spanish, some culture and to make my mind more colorful. However, no Jolla phone would have to sail over the Atlantic on my demand. I am a very proud (googlefree) Fairphone1 owner who only needs a SailfishOS port to achieve eternal bliss. In fact, I don't apply for myself. At home, in Germany, there are two Berlin based webdesigner, also great FOSS enthusiasts. They are my older sister and her boyfriend, and I owe them a thanks. They are always a help to me, supporting me with my thinking and doing, bringing me to the path of great ideas. Giving me a Raspberry pi, helping me install an Arch, financially support me with a purchase of a DSLR ( including extra battery), editing CSS files with me for a personal Panama-blog and even hosting it on their server, excusing me for being 2 hours late for a meeting, sending me recovery-distros to Panama to make my PC work properly again, just to name a few awesome things they did for me. Even my live performance experiment thingy wouldn't exist without them - the midi controller I used was lent out from them. Especially during the past months I've realized how much I appreciate the way I go they led me to. Both are great role models for me. Until your giveaway appeared in my newsfeedreader, I had no idea how to say thanks to them for all in a proper way. I do not see your competition as a chance to win a phone. Instead, you give me the possibility to say thanks to two persons I like a lot. You called your giveaway 'givewawa', missing the crucial letter of the y, leaving us to add the y, the 'why' in our comments. But haven't you seen it already? Let me quickly take the spare letter 'w', the double u, the double you. It obviously refers to my sister and her boyfriend. A wonderful couple, beautifully united in the letter of 'W', skillfully hidden in the seemingly misspelled word of "givewawa". That pointed out, you get the correct word of "giveaway". It all makes sense, doesn't it? Destiny, it is destiny. Furthermore, the word was shifted from its original meaning, it evolved, it grew wawa-wings, and it will fly to its destination to Berlin. No wait, it will sail. It will sail for sure. You, Carol, have the possibility to bring joy to three. On half of joy for me, and 'the other half' for them. Sounds great, huh? Now to restore a little seriousness, they have really deserved this Jolla. I wish every other participant good luck and Carol the spirit to choose the right one. I've not been as active as some others but have a solid record. I'd definitely add to the noise coming from the USA. But more importantly, would add perspectives of mobile not always heard. I am a Jolla worshiper because of its unlikeness and freedom. But I am not free to buy it because Jolla is not shipped to the place where I am although I am in Europe, near the EU (maybe you heard of the last Europe's dictatorship, Lukashenko and so on). Ciao, i would like win a Jolla because I believe in sailfish os, in his movement and in his future, the only thing i can do is spread the voice and repost retweet and forward all about Jolla and sailfish OS. I still love my n9 but i wanna continue with the legacy, i began with my n900 that was me replaced with the actual n9 due a malfunctions ubs port, now i will wait the time that i can buy The Jolla if i will not win this competition. Thanks for the opportunity you give to us. Well, what a kind gesture to give away a phone. Not long after Elop returned back to the US to collect it's bonus and take office at Microsoft again, 50% of the personnel was already on the verge of packing their begs. As if dumping the entire Meego/maemo team wasn't enough years earlier. So I'm left with a broken Lumia that needs replacement, competition in the form of Android I'll never use, and Microsoft I now have a moral grudge against. Jolla seems nice though, the minimalistic design, the beautiful interface and interaction, and a small creative team with a new vision, yes they are "unlike". And I "like" that. But the price has kept me from buying it so far, it's a little too expensive at the moment for a student. I dropped my intentions to make a (very simple) application for WP and learn a little of the "craft" after knowing I was quiting the system anyway, but I would love to dive into it on Sailfish. Especially still being new, not loaded with 800.000 apps in the store, it's probably even more interesting. I have done not one contribution to the Sailfish community yet, but I hope to one day step into it. I'm sure you are going to make somebody on here very happy. Hi, I like Finland and the idea of a good and powerful finish smart phone. There should be more shops in Europe that sell jolla phones, e.g. here in Germany. Jolla.com delivers to the entire EU+Norway/Switserland. Because Jolla is still not available in Brazil and I'm tired of my n900. My current plan is saving money to buy a Jolla to be delivered to a friend's house in Germany who in turn will deliver it to me next time he comes to Brazil; it may take a year or two, so having shipped directly to me will be much better. Besides, being an enthusiast and the first Brazilian to display a Jolla phone around here will help spread the unlike message of Jolla and create more fans. Up to now I'm just and enthusiast who speaks about how cool Jolla is and how I'm going to have one for more than a year but who still has nothing to show to anyone. Having my givewawa Jolla I'll show people that that my prophecies about the unlike and revolutionary phone have been fulfilled. i'm so excited to hear this as i have been waiting for a give away of a jolla phone for the past one year. i would really like to own one jolla because i seriously miss nokia and its previous glory and somewhere in this crowded world with androids, it gives me a hope of a better phone that stands out from the rest and the other half concept was something which i had in my mind for the past 6 years.so seeing the concept in reality and that too from ex nokia employees makes me sooo wannting this phone for real. and the fact that i currently own a nokia 100 and would like to upgrade to a smartphone just supports it. i would like to tell you that im an active volunteer in many social projects like spicmacay,chinmaya and many more local ones and the smartphone would really help me a lot in the organising and the other halfs will definetely come in handy once executed nicely. being a programmer too i am too eager to help out the jolla community to my fullest and make the community much more larger than the androids. thank you for providing such a wonderful platform for a giveaway like this.hope the deserving one wins.! I'd like to enter the giveaway competition as it would allow me to better understand the Jolla device / OS / Ecosystem and I could better follow it to post Jolla related material on the website Mobile Linux News (http://www.mobilelinuxnews.com). I need a Jolla Phone!!! eh so i'm a s/w tester and i'd love to verify if jolla can make me forget how to use any other mobile OS. i had the chance to get my hands on N9 ( developers. device). i literaly struggled till i got used to a phone that came after that. 1. I'm writing from Warsaw, which is often called Wawa by Poles. 2. I'd like to experiment with Mer+Nemo on my N9, but I'd like to have some solid successor in case I'll brick N9. She has always been kind of a luddite; it took me forever to persuade her to buy a mobile phone (a Nokia, of course), even longer for her to get en email address. Now she's getting ready to enter the world of smartphones, but so far it has been an uphill battle. First I purchased a cheap android phone with qwerty keyboard, as she didn't feel comfortable without that. Well the keyboard sucked, and android is just - well android. The I bought a ZTE FirefoxOS phone, but sold it again after seeing that it didn't even have Danish keyboard layout and certainly no matching dictionary. Now I've glued together the micro-SIM she had to use, so I could put it it the trusty old Nokia 2730(?) she got from me years ago, and she's got a working phone. But in these days "feature phones" just don't cut it anymore. Bus tickets, Netbanking, browsing etc. is basically a no-go. As I saved up to be a "1st On'er" it would be very handy if we had the same kind of phone, so I can offer support and suggestions for her. After all the trouble she's naturally hesitant in sending several hundred euros on a new device, and as I'm on a fixed, low pension (breakdown during the IT-bubble), I can't just pull up the old moleskin and buy her a X-mas present. Years ago in the 90s I worked on KDE, and I have been working as the maintainer of the ownCloud Contacts app (unpaid) for 2½ years, but stopped in May due to workload and different opinions of governance. I'm totally new to Sailfish/Jolla; I'm mainly an Android user. My phone gets clunky and slow after a while, and I've been looking for a new OS/phone to replace it. I was researching about Jolla when I stumbled on your blog. As I read the comments, I can see many people who have such impressive stories and have contributed to the Jolla community. They clearly deserve to win this phone! As for me, my entry is simple. I'm a smartphone lover/user. It would be awesome to have an opportunity to experience something new different from Android/WP/iOS. Anyhow, good luck to everyone above and kudos to Carol for organizing this event! Interesting Givewawa or giveaways has always attract lot of people, from the needy to the greedy. Its very humble of your to give away something that is currently a much in discussed and an eye candy for others, Interestingly so is karma the more goodness you give away the more it come back to you. The phone that you are planning to give out is something that has fascinated many minds, have seen the operating system stumble as a kid but slowly and steadily its getting matured nurtured by community of developers and application developers, gone are the beta days the phone and software has come a long way from being an idea to a concept and finally to a reality. Having worked on PI and Ubuntu working on the Jolla shall be interesting indeed. Going to be tough decision to make about deciding to whom the phone should be handed over or given away to. I have contributed to MEego and Nemo. In fact , some of my patches have been accepted in Meego 1.1. I did all this on qemu, so it would be nice to have a hardware actually to fix/port applications . Secondly,i am in middle east right now. . I would like to show jolla as an example to people here that when trust, passion and commitment is there, great things/products are achieved by mankind. Brand names (Read Apple/Google) can be used as ego statements , but open source products like jolla, shows the power of freedom and unity . I don't know how to write apps, and I don't need a new phone, but, if you want someone to test the new Jolla, I'm your man. I bought my N9 as soon as they were released here in Australia. Shortly afterwards I realized how good the N9 was and still is. When my wife spilt her glass of beer over my N9 I gave it a shake and rub and it was fine. I took my phone with me working in the gas fields installing gas pipelines. The fine dust made from trenching gets in everywhere. Once my phone pocket got filled with dust and sand. My N9 was swimming in dust crap. I took out my phone and a teaspoon of dust poured out the charging port, the top corner where plastic was missing from dropping it on concrete and from the headphone jack. The phone didn't stop, didn't bat an eyelid. Just kept going. I washed the dust out of the earpiece speaker with contact cleaner. I could hear people again on the phone. (Yeah, I use my phone to talk to people, how's that for testing). Sometimes it still crackles but after a tap it comes good. In summer it got up to 45 C. The phone didn't stop. In winter it was below freezing. One morning I had the N9 in my water bag in the back of the truck. Drove out to work and then after about half an hour went to get a drink and couldn't. The water in the bag hose had frozen. My N9 just sucked it up beside the frozen water and kept going. No problems. Not long ago she went into a reboot loop and wouldn't boot. All my contacts and numbers were only on that phone and gone. You know how that feels. I tried and tried to bring her back. Tried all the old Nokia applications to fix her. Nothing, looping and looping. After about a week of trying it started flashing and the OS reinstalled. I didn't lose a thing. My contacts were all there, plus all my ringtones and notes, photos, the lot. Messages were backed up. What sort of sorcery is that? I was so happy because I was using my wife's pink S3. I don''t know what was worse, having the pink phone or uselessly double tapping and swiping the screen on that stupid phone. After three or four years of double tapping and swiping habits are hard to break. She was back for a month and I was at the hardware store getting plumbing fittings, the phone dropped out of its case and onto concrete. The checkout girl said, "So was the screen already smashed like that?" All I could manage was "No." I picked it up and the whole top right hand corner was glass dust and cracks ran to both edges. Double tapping did nothing, I pushed on/off button and my home screen picture popped up. I gave it a shake and broken bits of glass fell off. I swiped left and right up and down and it all worked. Apps opened and worked. I took it home and little bits of glass were coming off the screen. I found an old screen protector for the pink S3 and stuck it on the broken screen. It stuck and I was able to use the phone without getting glass on me. The only problems no double tap to wake up and when using it to talk the screen would go blank and I couldn't hangup. After a minute the screen would come back on and I could hangup. On the plus side though that last bit of dirt got blasted out the earpiece and the crackling was gone. I pulled the screen off. It was so broken that the lcd plastic was floating and the glass dust and the frame corner was broken off. I put it back together and yesterday got a new screen. All works perfectly now. Even looks like a new phone.. I can't guarantee that it will survive like the N9. I can't get a Jolla in Australia and I don't know if we will ever get them here, but send me one and I will let you know how tough it is. Thanks Shane. I'm not a coder, my main contribution to the open source community is to promote it online, to those around me , and in my country Ghana. I believe open source software like Sailfish is great because it puts the power and focus on the community, not in the hands of the mega corporations. So I'd like to have the Jolla so I can show it off. I'd like to show it off to the members of my community and people in my country as an example of how beautiful and functional a product can be that was made with the community in mind. I'd use it to show off to people an open platform which any of us can contribute to, applications which anyone can modify, and a truly amazing and different, smartphone experience. That's all I got, thanks for listening. I'd like to enter the givewawa. I really appreciate all that the community has done, and I feel bashful to be among such entrants. I've never owned a smartphone before. The Nokia 3390 was my first phone, and remains the phone that I used until very recently. Unfortunately, that phone finally failed me a week ago. After almost 14 years, it had survived so much and I love it so. I loved playing Snake on the ridiculous maze map at max speed, I loved composing my own ringtones using the composer 'app', and I loved how it would signal to me that I got a text message by beeping 'SMS' in Morse. Since then, I've been a fan of Nokia. I remember when the Nokia N9 first came out, and I thought to myself--finally a smartphone with quality Nokia hardware and a beautiful user experience. I just didn't feel like I needed a smartphone back then, though, with how well the 3390 served me. Then, Nokia jumped in bed with Microsoft, and the rest they say is history. I've been fascinated with alternative OS's to iOS and Android for the fundamental reason that it feels like there ought to be a more natural way to navigate a mobile device than the 'icons on a desktop' method that derived from desktop computing. I've never used an N9, but from what I hear, MeeGo provided that unique, natural user experience. I'm excited to try the Jolla phone now, as someone who has never owned a smartphone, so as to enter the Jolla experience without any previous biases. Unfortunately, I'm located in the United States, where finding a Jolla phone is a bit difficult. That's my story--I'm on the verge of getting my first smartphone, and I hope that I'll be able to dive into a natural OS like what I hear Sailfish is without any preconceived notions for how a smartphone ought to work. I want to be a Sailfish user from the beginning--one of the few who experience Jolla as a virgin to the smartphone world. I love the way this phone looks, but unfortunately I don't have one yet. I'm tired of android devices, and I'd like to have a Jolla phone. In Hungary Jolla isn't a widely known company, and I would be happy to have this device, and be one of the firsts to have it in the country. I would like to participate in such an occasion to obtain brand new Jolla phone :) I was always a faithful Nokia user, from the earliest editions available on our market - Nokia 3210, through n5510, c5, E51 and finally N9. I was delighted with each and every model, and N9 was the conscious choice, knowing there will be no upgrades of the phone, the MeeGo system won't be expanded and worked on, and - the most saddening news of all - that Nokia is bonding with Microsoft (I myself am a Linux Gentoo fan, and am not using Windows at all). The N9 turned out to be more than I ever expected and so I decided never to change the phone - alas! An accident happened, and my beloved phone smashed on the cobblestone :( and went dead. As it happened, I was just finding out about my pregnancy, so buying a new N9 phone was out of the question... And so, since half a year I'm using a borrowed Samsung Galaxy S2 with Android on it, and I must say it is hard. The use is not as intuitive as it was on N9, not to mention the simple text entering - it kills me to write a message these days! Jolla, as a N9 descendant has raised my curiosity, but is currently out of my reach. And I must mention that my husband will be beyond delighted if you decide to give the phone to me - he is a programmer and has, in the past, encoded a radio for my N9 and is planning to develop some more on Jolla devices. Thanks for offering such a chance!